This shirt is a very deep red. It does up with snaps and appears to have breast pockets with flaps. There is a very subtle black design on it. It's my favorite Sam shirt - very gorgeous. 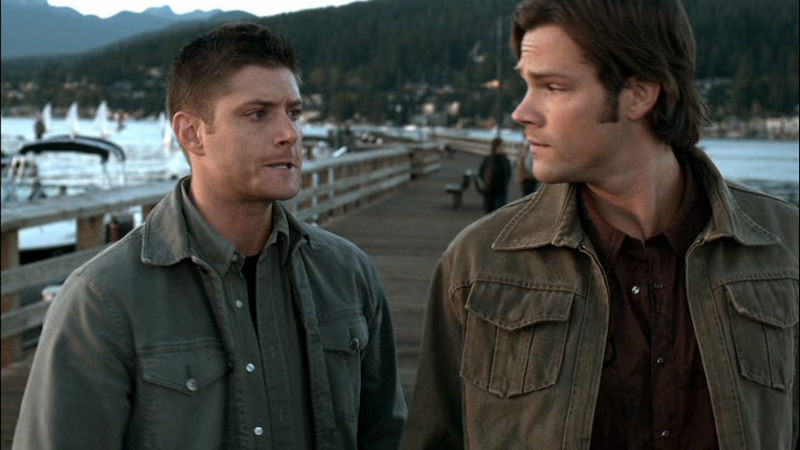 At the very end of Wishful Thinking (4x08), Sam is wearing it on the pier when Dean admits that he remembers Hell. In Death Takes A Holiday (4x15), Sam wears it when they go to interview the shooting victim. He keeps it on until the attempted séance in the graveyard. In The Monster At The End Of This Book (4x18), Sam wears it once he changes out of his suit in the beginning of the episode until after they see Chuck’s publisher. In Good God Y’all (5x02), Sam wears it when he and Dean part ways at the scenic lookout. In The Curious Case of Dean Winchester (5x07), Sam starts wearing it after they change out of their suits and go try to track down Cliff at the motel. He keeps it on until after the poker game. In Dark Side of the Moon (5x16), Sam wears this in heaven when they enter Dean’s memory from when Dean was four years old. When they change memories, Sam’s clothes change as well. 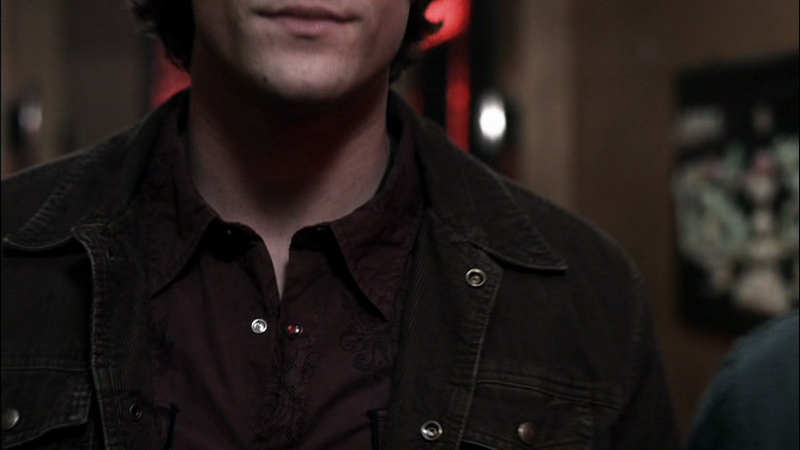 In Two Minutes to Midnight (5x21), Sam starts wearing this shirt when they are getting ready to go after Death. He wears it for the rest of his time in the episode. In The Third Man (6x03), Sam wears it at the end of the episode, when he and Dean talk next to the Impala. In Like a Virgin (6x11), Sam wears this shirt when he and Dean talk at the end of the episode. In ...And Then There Were None (6x16), Sam wears this shirt in the graveyard at the end of the episode. In Season 7, Time for a Wedding (7x08), Sam wears this shirt at the end of the episode when he signs the annulment and they bid farewell to Garth.